Album: "Scientist Rids The World Of The Evil Curse Of The Vampires"
1. 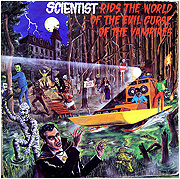 Scientist Rids the World of the Evil Curse of the Vampires is the title of this record. 2. The album cover. A bunch of Jamaican dudes on a boat with a spotlight, a gun, and a turntable, chasing all sorts of monsters out of a swamp. With song titles like "The Corpse Rises," "Blood on his Lips," "Cry of the Werewolf," "Plague of Zombies," and "My Teeth in Your Neck" (hey wait you're supposed to be ridding the world of this curse! What's the deal! ), can't go wrong. Now, the music itself doesn't really lend itself to a horror theme. At the beginning of most of the songs, Scientist will growl out silly things like "I am the living dead!" or "I want blaaaaaaaaaahd! Ha ha haaaaa!" but the theme really only finds it was through in those moments. I know I'm supposed to be running away from this werewolf but I think maybe if he just comes over here and smokes some of this he'll calm down a bit and, you know, eat some cookies instead of eating... me. I guess that's what dub is, though: sample-based music made for people to chill out to. In that respect, Scientist Rids the World of the Evil Curse of the Vampires certainly delivers. The source music seems pretty good based on these tracks, and the mixing itself is very smooth. It comes together pretty well, and actually the silly evil laughing/shouting between some of the songs really ruins the flow. At least in this case, dub and horror don't blend well. If it has been done better by somebody else, please feel free to let me know. If you're looking for a groovy record to spin for your hip Halloween party, you may want to look past this one. Unless, of course, your idea of a Halloween party is getting high in your friend's basement and listening to that one peroxide-blond suburbanite buddy that thinks adding "mon" to the end of every sentence is hilarious. This album is certainly not what I was expecting, but I really do like it. Even if I were to get pissed about the lack of monsters, the music just relaxes that bitter resentment right away and replaces it with some head-bobbing. Maybe this is how Scientist actually does rid the world of the evil curse of the vampire: making the vampire chill out. From the looks of it, the CD re-release of this album is out of print and carries a steep price tag nowadays. If you're not willing to track this one down on vinyl or CD and aren't willing to break the law (you'll probably want to break some other laws to get optimal enjoyment out of the album, anyway), several of the songs are apparently features in Grand Theft Auto III, including my favorite "Dance of the Vampires." I remember this from GTA III.